One of the main reasons the Oakland A’s chose a site next to Laney College for their new ballpark is that the team believes its fans will love going to games there. And they’re probably right. If built, the ballpark will offer sweeping views of Oakland’s crown jewel, Lake Merritt, and of the beautiful East Bay hills. Plus, it’ll only be a short walk from the Lake Merritt BART station, and many new bars and restaurants will surely open in the area for fans. Of the three possible ballpark spots that A’s President Dave Kaval announced earlier this year, the Laney site was clearly the best one for the fan experience. It was also best for banks and other private investors that the A’s ownership will count on to finance the $500 million ballpark, plus ancillary development like bars and restaurants, housing, and a parking garage. According to several knowledgeable sources, investors preferred the Laney site because it has the best chance of penciling out financially over the long-term due to its proximity to downtown. Why? Cities that have built ballparks in downtown areas have a record of success, noted Michael J. Berne, president of Berkeley-based MJB Consulting, at a forum on the A’s’ ballpark plans this fall. When done well, professional baseball and basketball facilities — because they host so many games and can be used for other events — often spur growth and help revitalize downtown areas. They have the potential to “transform stadium areas into year-round destinations to play, live, and work,” explained Berne, who has analyzed new ballparks around the country. (Disclosure: I was the moderator on the ballpark panel with Berne.) It’s why Major League Baseball now officially prefers downtown sites to suburban settings. But while a ballpark near Lake Merritt and downtown Oakland may be good for fans, bankers, and MLB, the Laney site is also by far the most controversial of the A’s’ three final spots — the other two were Howard Terminal next to Jack London Square and the Oakland-Alameda County Coliseum property. And the A’s’ selection of Laney has been met by a fierce backlash by residents, activists, small businesses, environmentalists, college students, and faculty members. Plus, the response by Oakland elected officials has been tepid at best. The community’s reaction to the Laney selection prompted us to put together this package of stories on the team’s plans. 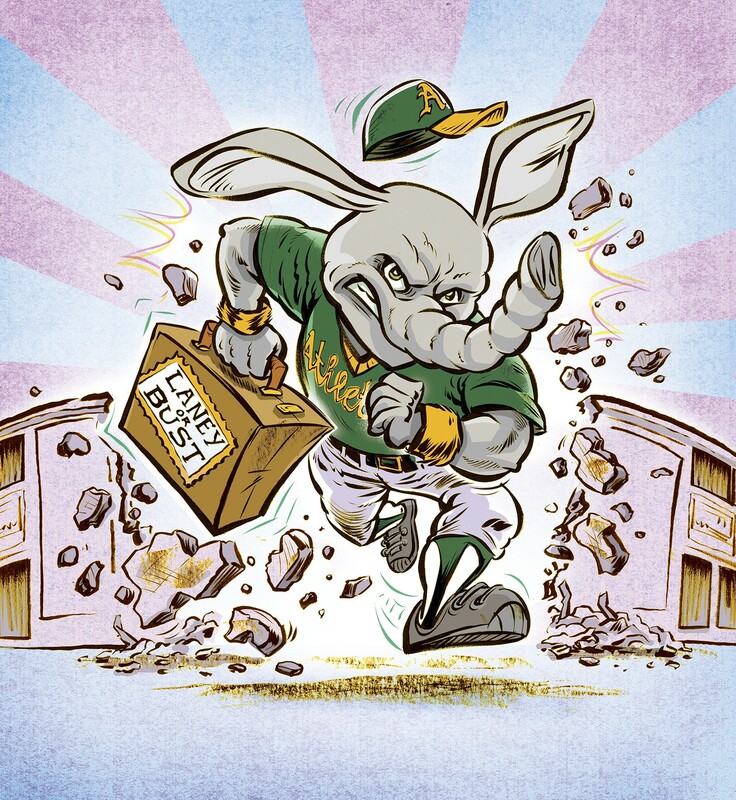 Politically, the Laney site will present a dizzying maze of challenges for Kaval and the A's. First, the team needs approval from the Peralta Community College District Board of Trustees to lease and build on the district’s property on East 8th Street, across from Laney. The board will be under intense pressure from faculty and students opposed to the plan to either reject it or demand that the A’s provide a large financial package for the college. Oakland Assistant City Administrator Claudia Cappio also noted that the plot of land being eyed by the A’s includes parcels owned by BART and Union Pacific Railroad, meaning that the team will have to negotiate for that property as well. In addition, the team and the city will have to determine if some of the land closest to the estuary is controlled by the state under its tidelands trust doctrine, which governs the use of shoreline property. If so, then the State Lands Commission will have to approve the deal in what would likely be a long and complicated process. The A’s will also likely need approvals from the Bay Conservation and Development Commission, which also has a say over coastal development in the region, and from numerous other regulatory bodies. And, of course, the A’s will need the blessing of the Oakland Planning Commission and the City Council, because the property is currently not zoned for a stadium. In addition, if Oakland follows through on the same promise it made to the Raiders, then the city council will also have to partner with other public agencies to create a special financing district for the A’s to pay for $200 million in infrastructure upgrades. At minimum, the ballpark will need a new offramp and onramp to Interstate 880, and the Lake Merritt BART station will have to be expanded. Anyone who has watched Oakland council meetings over the years knows that the A’s have many difficult nights ahead. “They need a variety of major approvals,” said Cappio. Plus, the A’s will have to complete a detailed environmental impact report for the project and fight off lawsuits from different groups opposed to their plans. And that’s not counting all the community meetings the team will have to hold to address residents’ concerns. In short, Kaval’s estimate of opening a new Laney ballpark by 2023 could be optimistic. The A’s, of course, could have avoided most if not all of these headaches by selecting either of the other sites. In fact, there likely would’ve been no political or community opposition to either of them. However, the other sites weren’t without challenges. Howard Terminal is about a mile from the closest BART station, and the A’s were worried about fans safely crossing the railroad tracks at Jack London Square. And private investors couldn’t get excited about the idea of financing a new major sport complex and ancillary development at the Coliseum property because it’s too far from downtown, sources said. The A’s, in other words, made a clear choice: please fans, investors, and MLB and then run gantlet of Oakland opposition and bureaucracy. Many faculty members and students are either skeptical or completely against the A’s’ plans to build a ballpark next to the campus.